Savory meets sweet in this deliciously fresh combination. 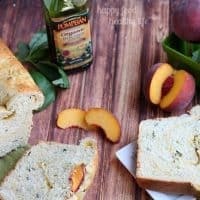 This Basil Bread with a Peach Swirl combines two of my favorite farmer’s market finds in one bread to make something so fresh with unique flavor. This post has been sponsored by Pompeian, but as always, all opinions are my own. A few weeks ago, my honey, son, and I were strolling along at the local Downtown Salt Lake Farmer’s Market. Wife had only been home for 12 hours after her 7 months away for military, so I was absolutely feeling on top of the world to just all be together again. Checking out the handmade goods, petting random dogs, listening to locals jamming on their guitars, and of course sampling all the fresh and local food! These are some of the things that make up the happiness in my soul. And sharing those experiences with my loved ones is what it’s all about. Towards the end of our time at the market, I picked up a bunch of fresh peaches and basil. Those are two of my favorite fresh summer flavors, but what came next was not what I had expected. I had no intentions or plans for them – they just happened to both be in my bag for later use. But I did want to get a whiff of that delicious fresh basil. So I opened the bag to take it all in, and that’s when the flavors of the fresh juicy peaches came wafting in my nose as well. Holy amazing flavor combination! How did I now know about this?! A pie? A beverage? A cake? A cupcake? A bread? Yes! A bread is what was going to be the fate of these farmer’s market finds. Even though bread is not my strong suit, I was determined to making it happen. I started doing my research. What would the base of my bread be? How was I going to incorporate the peaches? After a week or so of research, I got working. And let me tell you guys, this bread took three whole tries! I wasn’t giving up. The first one… too dense and, frankly, disgusting. After one bite, it headed to the trash. The second… completely my fault. I set it out for it’s first rise, and then I went to the pool with some friends. I had plans to finish it when I came back in. Multiple beverages later, and a late night of fun, and that bread just wasn’t happening. With work the next day, I just had to scrap that recipe. Then the third try. I knew it had to work. I just knew it. And my goodness, it so did! I actually based the final recipe off of Pioneer Woman’s Homemade Cinnamon Bread recipe, so I knew it would be delicious. As one who does not do well with yeast, I was scared. But Ree’s instructions were spot on, and resulted in a bread that rose with no problem and came out practically flawless. I did know that I wanted to make a couple slight changes though. There was quite a bit of butter in Ree’s recipe, and while butter is delicious, I wanted to see how olive oil would fair in its place. I was slightly nervous, especially after two recipe fails already, but using this handy dandy conversion chart, it’s really quite easy to trade out butter for olive oil in any recipe. 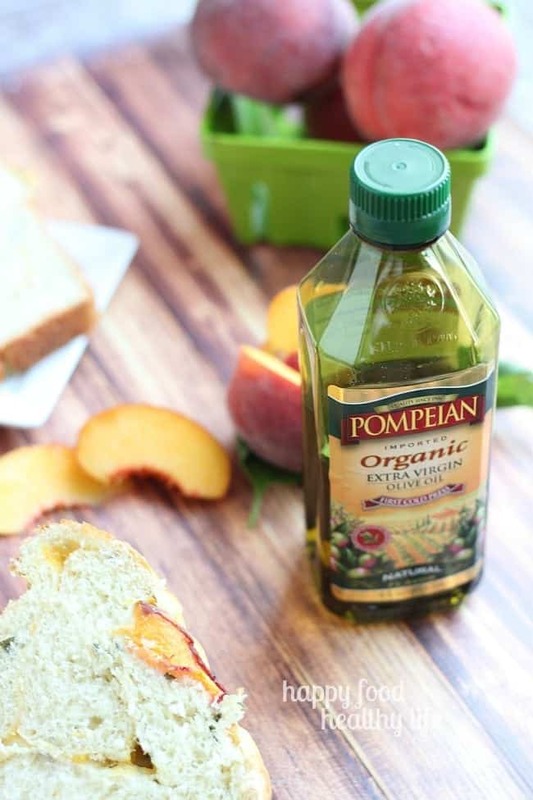 As a leader in the olive oil industry and the number one selling Extra Virgin Olive Oil in the U.S., Pompeian is celebrating National Olive Oil Month this August by launching the Pompeian Pledge – a call for consumers nationwide to swap butter for olive oil in everyday recipes. It’s surprising to me, but most people don’t realize how easy it is to swap out some of the less healthy ingredients in your favorite recipes for something a little more beneficial to your body. 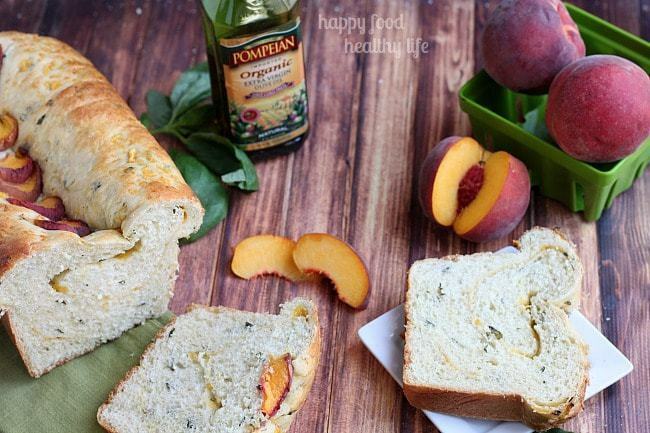 Pompeian is rewarding consumers for pledging to make that swap from butter to olive oil. Simply visit Pompeian to take the pledge. 1,000 fans who sign up will be randomly selected to receive a gift from Pompeian (a free movie redemption code and a coupon for a free bottle of olive oil), plus every week 5 additional fans who have pledged will win a fun prize pack on Pompeian’s timeline. 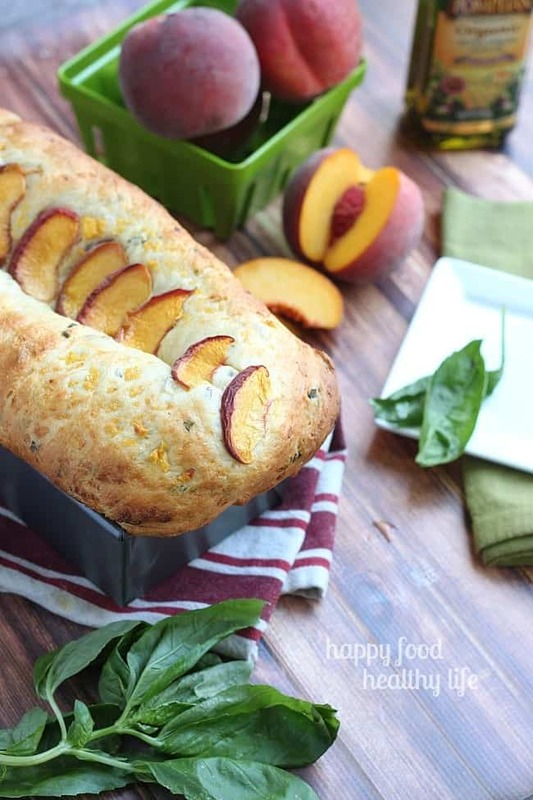 If you’ve never tried the basil + peach combination, you must do it now. It is truly full of the flavors of summer. And I don’t mean sugary lemonade and popsicles. I mean the authentic fresh farmer’s market flavors that really make your taste buds happy. There’s really nothing quite like it. Try the recipe out as soon as possible, before the days of summer are completely behind us! Heat milk and olive oil until very warm in a small saucepan. Be sure not to boil. Allow to cool until still warm to the touch, but not hot. Sprinkle yeast over the top, stir gently, and let sit for 10 minutes. In the bowl of an electric mixer, mix sugar and eggs with the paddle attachment until combined. Pour in milk/oil/yeast mixture and stir to combine. Add half the flour and beat on medium speed until combined. Add the other half along with the chopped basil and beat until combined. Switch to the dough hook attachment and beat/knead dough on medium speed for ten minutes. If dough is overly sticky, add 1/4 cup flour and beat again for 5 minutes. Heat a metal or glass mixing bowl so it's warm. I just placed my bowl in the microwave for about 30 seconds to warm the bowl. Drizzle in a little olive oil, then toss the dough in the oil to coat. Cover bowl in plastic wrap and set it in a warm, hospitable place for at least 2 hours. Turn dough out onto the work surface. Roll into a neat rectangle no wider than the length of the loaf pan you're going to use, and about 18 to 24 inches long. Smear with about 1 Tablespoon of olive oil. Mix peaches and honey together by pulsing in a food processor lightly until you have a chunkier puree. Spread this peach mixture on the dough, leaving about 1/3 of a cup left over to top the bread. Place dough, seam down, in the pan. Top with remaining peach puree. Cover with plastic wrap and allow to rise for 2 hours. 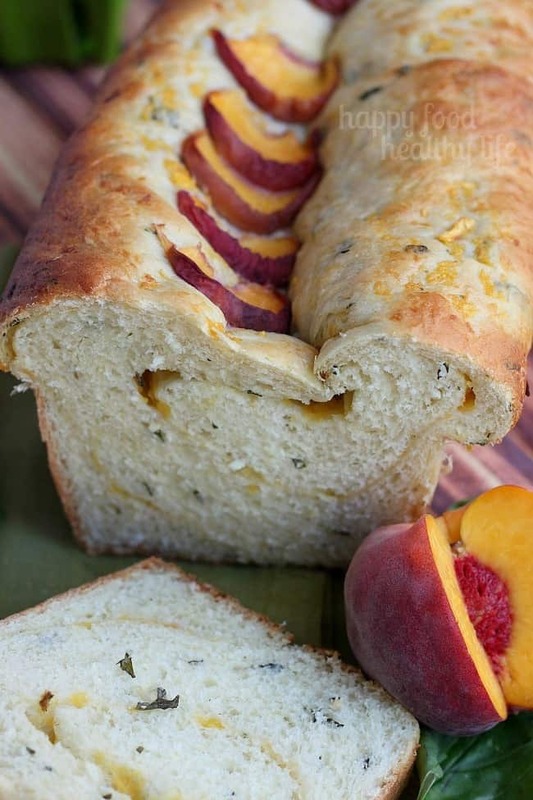 Place sliced peaches on the top of the bread for garnish and added flavor. Bake for 40 minutes on a middle/lower rack in the oven. Remove from the pan and allow bread to cool. Slice and serve. This is a sponsored post written by me on behalf Pompeian. oh that sounds absolutely yum! I will be making that happen for sure. I found the link to this recipe over at Real Housewives. Who would have thought that combination would ever go together. I it looks intriguing, delicious and wonderful! I’m going to definitely try this out. Plus, from now on, I’m smelling all my grocery bags! This sounds amazing! Peach and basil are such a great combo. Pinning so I can try it later! I love this loaf Holly, such a great flavor combination! Pinning and featuring you this week at Showcase Your Talent Thursday. Thank you so much for the feature Emily! This is one of my favorite recipes to date, so I really appreciate the compliment!